1) I have never grown facial hair. I simply can't do it. Although that has never been empirically determined, there are some things in life you can extrapolate with confidence. My body is smoother than a baby-powdered baby's bottom. I am wind-tunnel tested, aerodynamic. My coefficient of friction is lower than Bank of America's approval rating. While it's generally an Asian thing to lack body hair, other Asians take one look at my silky legs and proclaim "damn, you SO Asian!" 2) I don't do anything I'm not good at. I'm too competitive. Odd Job from Goldfinger. Kickin' it old school. 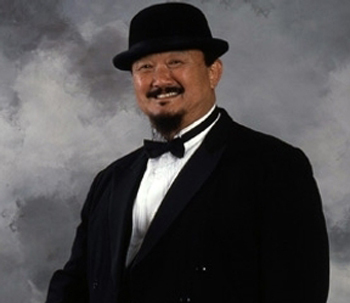 Mr. Fuji from WWF. Fake kickin' it. 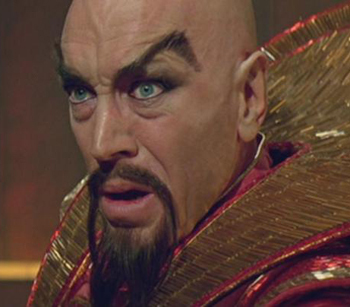 Ming the Merciless from Flash Gordon. Fake kickin' it Asian, but I dig Max Von Sydow and will consider him an honorary one. Kickin' it generic. The "thug #4" guy who was in every 80's movie that had an Asian bad guy in it. Didn't he also play Genghis Khan in Bill and Ted's? I think so. 4) I don't like cancer. 5) I often buckle under peer pressure. 6) I like milestone numbers. Last month, I got an email from Doug. He's the big daddy 'round these internet parts, and when he speaks, people listen (he also has an excellent radio voice in real life, so that helps). It was a mass email to the dad blogging collective, inviting us to join his Movember Dadblogger team. Movember is like a walk for hunger thing, but instead of walking, men grow moustaches. And instead of hunger, the money raised goes toward supporting awareness, research and survivorship for prostate cancer and other men's health issues. In other words, a really good cause. While this email invoked fact #4 (not liking cancer), it head-on collided with facts 1 and 2 (I'm bad at facial hair and I don't do things I'm bad at). Since it was a mass email, I quietly let it sit in my inbox, unresponded to. But Doug is a bugger, and wouldn't let me off that easy. He emailed me. Individually. When I provided the excuse that my facial hair grows in all scraggly like a Vegas morning-after, he assured me that the worst facial hair growers usually raised the most money. While those of you who read this blog know that I am never above making a fool of myself for your entertainment (related: I really hope you watched the final 40 seconds of the video in my last post), I need to look presentable for work (I sell software to government folks). So Doug backed off. And then a series of events happened. He recruited Shannon to join in on the goading. This went on for weeks with the two of them. Oh fact number 5 (peer pressure wimp), you are a scourge to my existence! I saw Real Steel, and was reminded that Asian villains are cool. Fact #3, activate! Yesterday (the final day to join), Doug tweeted that they were up to 49 members on the team. The next guy would make it an even 50 (milestone. dammit). Almost villainesqueSo here I am. Movember Dadblogger Team member #50. Clean shaven and ready to exert all of my efforts into sprouting a few hairs on my face for a good cause. While I ask all of you for moral support in this endeavor, I would really love it if you could sponsor me. Any amount would make this embarrassment worthwhile. And if what Doug said about the worst hair growers bringing in the most cash is true, then my five errant whiskers will fund a hospital wing somewhere.